(Sewing) Feets don’t fail me now! A number of ‘feet’ came with my sewing machine (Janome 6260QC) but I really didn’t know what they were for or how to use them… so I went looking for information. 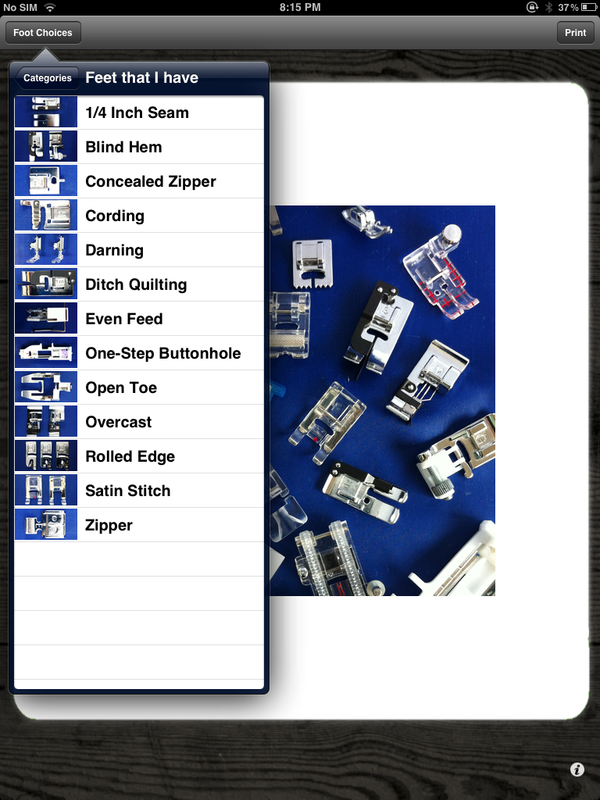 Some of what I found is specific to Janome but hopefully users of other brands will pick up something useful. Janome’s US website has a great range of video tutorials on how to use various feet – they are short and easy to view (you’ll need to disable your pop-up blocker – the videos pop up in a new window). which is great for pictorial explanation. I particularly like viewing this type of book via my iPad because I can zoom in on the pictures and really ‘see’ what the foot looks like. 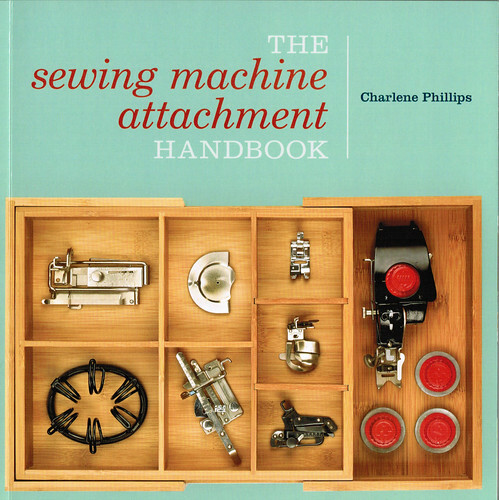 The book is very comprehensive, covering the history of attachments (which is quite fascinating…really! ), determining your shank type (the shank is the ‘leg’ that feet are attached to – shanks are typically either high or low), how to clamp attachments to your machine and finally, how to use your attachments. I had a number of ‘aha’ moments reading through this book. created by the owners of Online Sewing. I don’t have any connection to them but I do like this app! (it’s also available in DVD format). It’s specifically targeted at Janome users and is similar to the Janome video tutorials but provides more information and allows users to highlight the feet that they have as well as create a ‘wishlist’ of feet. additional uses – this section is the most valuable to me – I knew that feet could be used in many ways, but needed some hints. 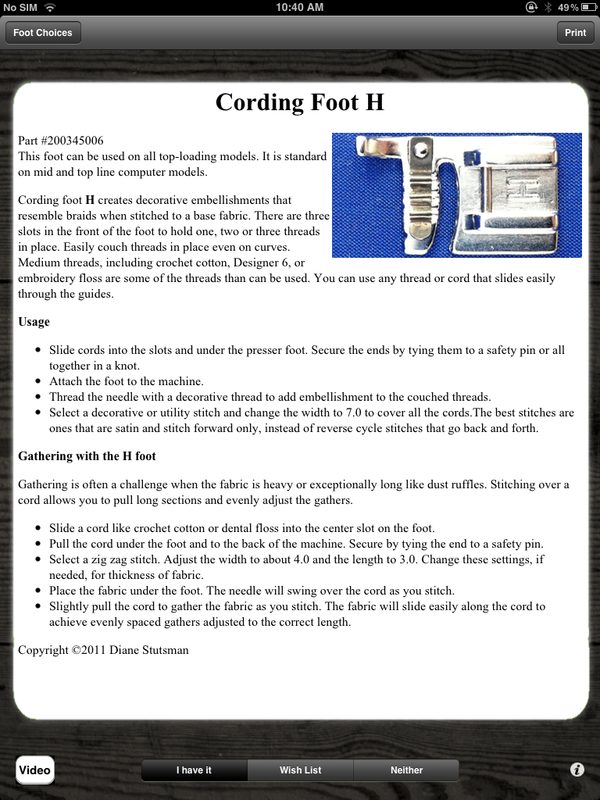 The screen shot below describes how to use the cording foot for gathering…never would’ve crossed my mind to use it this way! 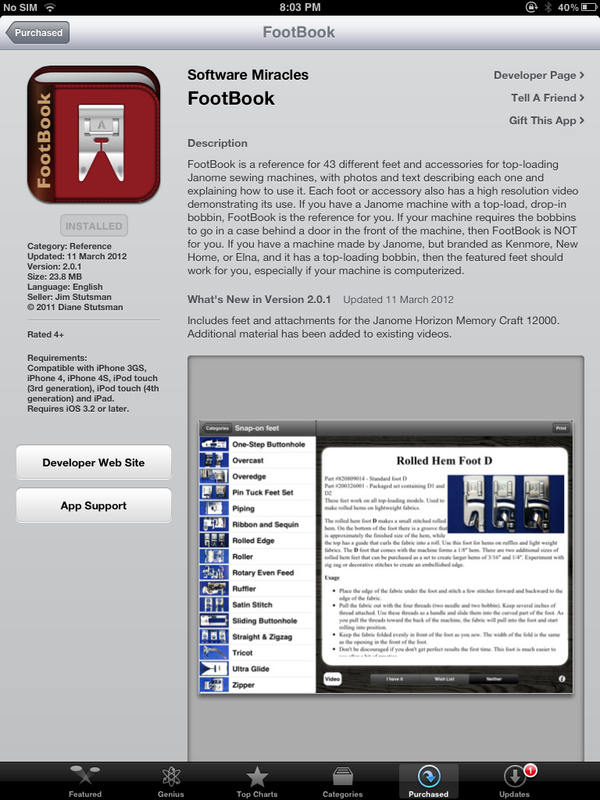 In addition to the text, they provide a link to a video of each foot in action. The videos are clear, well-presented and easy to apply, with the iPad set up next to my machine. The video on how to use the rolled hem foot significantly saved my sanity! I also learned of another, more effective way to insert invisible zippers. Bonus! 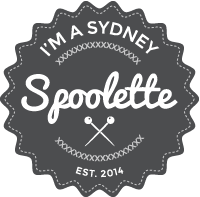 So, I feel like I’m getting better on my ‘feet’…. Are there any ‘feet’ resources that you recommend? PS. After I initially posted this, I got curious about where the phrase “feets, don’t fail me now” came from…we say it as we fly out the door when late for something. Here’s what Wikipedia has to say: Origin: Catch-phrase that possibly originated during the vaudeville and chitlin’ circuit days. Spoken by several Afro-American actors in motion pictures of the 1920s to 1940s, usually when scared by a ghost or such (whereupon the character scooted). Delivered by actor Willie Best (1913–1962) in the 1940 Bob Hope film “The Ghost Breakers”; delivered by actor Stepin Fetchit (1902–1985) in several films; often attributed to actor Mantan Moreland (1902–1973).